"Then it was I first realized that for her this broke a silence of thirty years; the inconceivable silence of the plains." Published by McClure, Phillips, & Co. in May 1905. 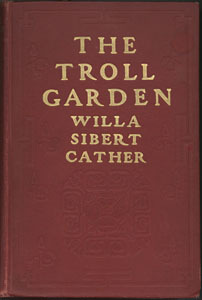 Published in Bookman in July 1905 and collected by L. Brent Bohlke in Willa Cather in Person: Interviews, Speeches, and Letters. Issues of Gender and Lesbian Love: Goblins in "The Garden Lodge"